The New Zealand Herald performed a startling inversion of morality today; casting hero as villain and terrorist as victim. With the sensational headline, “Shocking footage – Israeli police shoot suspected terrorist”, readers were enticed into watching a brief snippet of video footage of an Israeli policeman shooting and ending with multiple uniformed men surveying a scene. The article failed to mention that just prior to this, two Palestinian men dressed in suits and ties sat at a café before pulling out Carl Gustav-style guns and shooting, killing four people and hospitalising 18. The attackers were cousins; one was arrested and the other, who refused to give himself up, was shot and wounded by a security guard; he is currently hospitalized and being treated by Jewish and Arab medical staff alongside his victims. 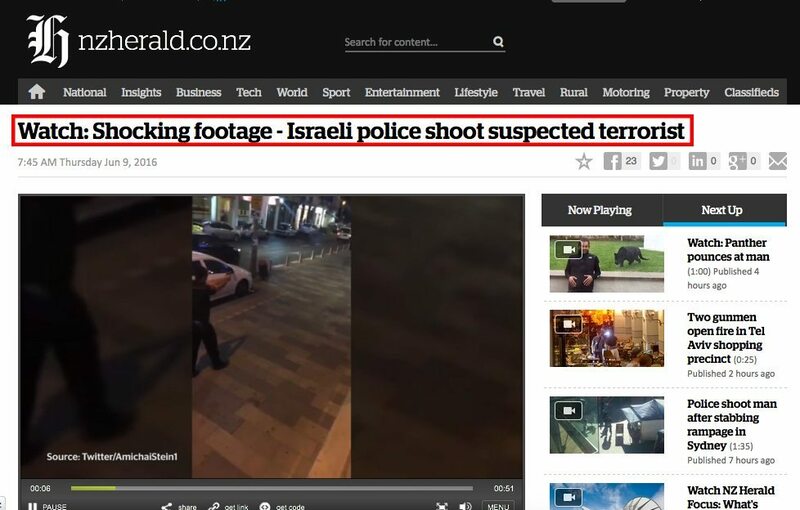 But, perhaps in the interests of superficial click-bait, the Herald omitted all of this context, focusing instead on the “shocking” fact that a “suspected terrorist” was shot by an Israeli policeman. For a start, there was nothing “shocking” about the footage, either visually or in principle. There was no blood, no one falling to the ground or running for cover. And is the idea that a terrorist in the middle of a shooting spree might be shot really that shocking? Would footage of police in the USA shooting a person rampaging with a machine gun through a school, for example, be described as shocking? Would the shooter be presented as a victim? 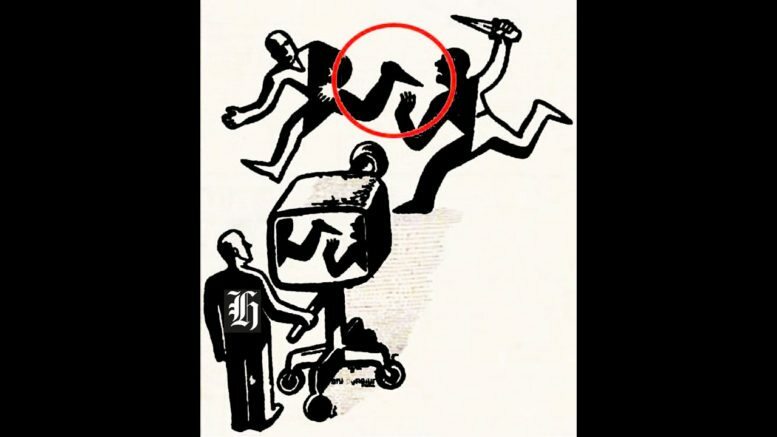 Compare also the NZ Herald’s treatment of this incident with its treatment of another, similar incident that occurred on the same day in Sydney. A man wielding a knife was shot by police and four bystanders were injured by the ricocheting police bullets. The headline was “Police shoot man after stabbing rampage in Sydney”. The actions of the perpetrator are highlighted, while the actions of the police are minimized – the opposite of the headline for the incident in Israel. One wonders whether the click-bait mentality, which encourages lowest common denominator thinking and pulls on the purchase power of everyday prejudice, has coloured the judgement of NZ Herald’s on-line team. Perhaps that is the more generous conclusion. That very similar content should receive such different treatment leads to the conclusion that this is bias at work. Regardless of the motivation, the effect will be to garner more anti-Israel sentiment, which often translates into anti-Semitism. It will also give credence to a perspective that asks us to sympathise with terrorists and see them as victims of society, rather than hold them to account for their warped ideology and barbaric actions. Dame Susan Devoy has recently brought attention to the power of the media. The NZ Herald editors have just abused that power. Shame on them.